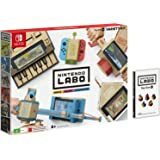 Amazon's Choice for "nintendo labo"
Customise your Nintendo Labo creations with this handy set of materials. 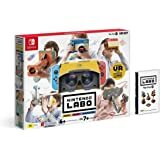 Building on the history of Nintendo, which is rooted in innovative entertainment and gameplay experiences, Nintendo Labo continues the company's mission of putting smiles on people's faces. 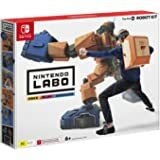 With each Nintendo Labo kit, inspired minds across all generations can transform modular sheets of cardboard - specially designed to interact with the Nintendo Switch console and Joy-Con controllers - into interactive creations called Toy-Con. From a piano to a motorbike, a robot and more, each Toy-Con comes to life when combined with the Nintendo Switch in different ways. As you make, you will have fun discovering how the technology works and even invent new ways to play with each Toy-Con. For example, you can make a functioning 13-key piano that brings your musical arrangements to life once the Nintendo Switch console and Right Joy-Con controller are inserted. As you play, the IR Motion Camera in the Right Joy-Con detects which keys are pressed and plays each note through the console's built-in speakers. Budding musicians can also experiment with their own musical creations. Or, you can take control of your very own motorbike by constructing a functioning set of handlebars, with a Joy-Con inserted in each side and the Nintendo Switch console cradled in the middle. Simply hit the ignition button, turn the right handle to engage the accelerator, and watch your adventure unfold on the Nintendo Switch screen, as you race to new destinations. With Nintendo Labo, making and discovering is just as much fun as playing. Every Toy-Con creation presents exciting challenges and varying degrees of complexity, so each one is a unique experience. Making Toy-Con is especially fun with family and friends, as you collaborate and share each other's Nintendo Labo experiences. Once built, those with a creative touch can customise their Toy-Con creations with their own colouring pens, stickers and paint to give them a personal feel - the only limit is their imagination. Customisation Set includes fun stencils, stickers and coloured tape. 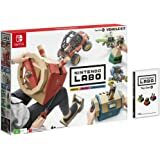 5.0 out of 5 starsThis a great product with heaps of accessories to add to your nintendo LABO kit. 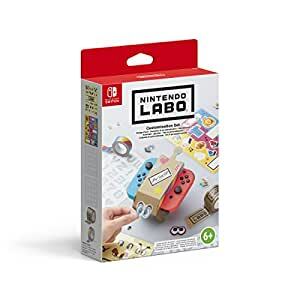 We bought this to go along with the Nintendo LABO kit we bought for our friends. It is really fantastic. Lots of stickers to stick on cardboard, and a stencil - which is brilliant. The boys definitely enjoyed it.